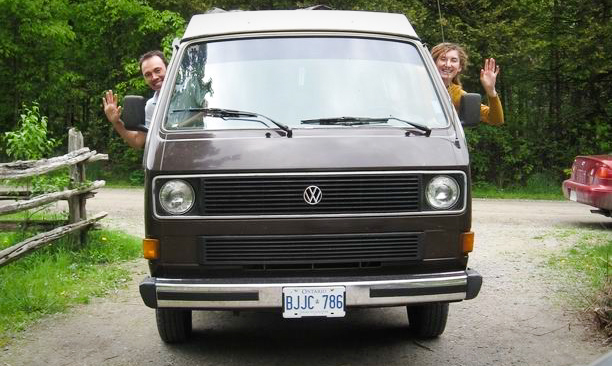 In May 2010, my partner-in-silliness and I made ourselves a home in a 1984 Volkswagen Camper van and took off for three months to explore North America. If you’d like to poke around in the Archives and read about our travels from the beginning, here is a link to our maiden voyage. If you’d like to get to know Amelia, our home on wheels, you can do so here and here. My techy husband created a funky Google map that he updated as we travelled. You can see the completed version here. Today, the blog is about finding the adventure in the every-day. I don’t really know what that means yet, so right now the blog is evolving and figuring itself out and I’m here for the ride. I like the excuse to write every day and I like the community that you gain by having a voice and space in this virtual world, the internet. Wow, I really admire of you, that will be a happy and romantic journey for you. Good luck.